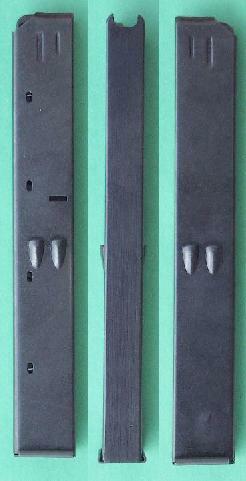 A number of manufacturers have produced after market UZI magazines. Unfortunately they do not have any identifying tool marks so it can be difficult to separate the good ones from the bad ones. And make no mistake - after market magazines are not all alike. They run the spectrum from very good to very bad. Know what you're looking at or you may be very disappointed. Construction: Heavy gauge metal, no seam in back, flat seam in front. Tool Marks: Nothing on the mag body. Sometimes "Made in China" on the floorplate. Reliability: Very good to excellent. Construction: light gauge metal, no seam in back, flat seam in front. Reliability: Poor. You can count on these magazines to give you problems. Witness Holes: three unnumbered holes. Tool Marks: "I.M.I" on lower side. Tool marks are added after the magazine was finished and are probably not original. Also seen with no marks. Comments: They have unusually long tear drop shaped magazine well stops. The magazines can be a little wide (front to back) for some loaders. Comments: Some purchased from Vollmer. Magazines can be a little wide (front to back) for some loaders. Construction: medium gauge metal, folded seam in back, no seam in front. Additional cut made after manufacture so they work in certain 9mm AR-15 rifles. Reliability: fair if you can get them in the gun. Many seem to be wide at the top and will not go into the gun easily or at all. Comments: Same as the FM magazines but with AR-15 cut added. Construction: medium gauge metal, folded seam in back, no seam in front. Reliability: fairly good but sometimes the top of the mag is too wide and will not go into the gun easily. Comments: These magazines are not actually made for the UZI. Although they work fairly well, the stops on the magazine will not contact the magazine well, allowing the magazine to be inserted too far and the potential for jamming. Construction: Heavy gauge metal, smooth seam in back, no seam in front. Reliability: Very good. Probably the best 40 round UZI mag you can find.